The delivery times may vary, see cgv contact us before the purchase. By clicking on immediate purchase, the customer certifies having read and accepted the general conditions of sale! Available at the bottom of this page. Polini maxi hi-speed evolution variator. Designation: Polini maxi hi-speed evolution dimmer. This evolution variator has a patented system to reduce the wear of the barrel. Indeed, this part being mobile, wear quickly. For this, polini have developed a system of internal lubrication of the barrel to extend its life (see assembly instructions). It has 12 rollers for a better distribution of the weight and slopes specifically studied by polini. The maxi hi-speed evolution will offer you a gain of acceleration and recovery. Comes with 2 sets of pebbles of 7.5 gr and 8.3 gr. Polini later developed the 12-wheel maxi speed controller for yamaha t-max, presented in the evolution 3 series, with an innovative patented lubrication system. Technical innovations: the buckle made of hardened, hardened and ground nickel chrome steel. It distinguishes itself for the high-capacity inner housing which acts as a reservoir of grease, inside which there is a special spring which allows a constant distribution of the grease on the barrel, even under the most difficult conditions inside. Pebble tracks have undergone a brightening treatment to improve slippage. The pebbles are covered by a new mix of nylon material and aramid fibers. The best performance is combined with lower maintenance costs. Thanks to the special features that improve the lubrication of the buckle and barrel, while the brilliance of the tracks and the material of the rollers allow a better resistance to wear. The drive has been tested at the Italian maxi scooter championship. Model list compatible with 241.696. T-max 500cc 4 stroke lc (from 2008). T-max 500cc 4 stroke lc inject. The processing time of your order can vary 7 to 15 working days, contact us before the purchase !! other thousands of pieces with misterbike-fr. Anti-theft, batteries, spark plugs, chain kits, pinions, crowns, chains, clutch discs, air filters,, oil filters, fuel filters, oils, engine gaskets, spinnaker gaskets, brake levers and clutch grips, grip pads, jaws brake, fixed and floating brake discs, brake pads, motorcycle tires, cross and enduro tires, scooter tires, quad tires, inner tubes, lamps and spotlights, wheel bearings and steering bearings, spraychain, turn signals, mirrors, fork tubes, cables, tank caps, handlebars, saddles, bolts, handlebars, valves and stoppers, contactors, workshop saddles, footrests, belts, exhausts, tools, top cases and windshields. Helmets, rain gear, clothing and anti-cold accessories, tire cover, etc. 03.25.55.74.71. Monday to Friday from 9h-12h to 14h-18h. 06.62.69.50.19. 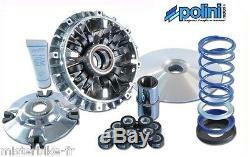 The item "variator variator polini evo3 241.696 yamaha tmax t-max 500 (12 wheels)" is for sale since Monday, May 30, 2016. It is in the category "auto, motorcycle parts, accessories \ motorcycle \ spare parts \ others" The seller is "misterbike-fr" and is located in / at bettancourt la ferée. This item can be delivered anywhere in the world.